Windows only: Concerned you're wasting disk space with duplicate photos but too cautious to go about wantonly deleting pics? Fire up VisiPics and find those dupes. VisiPics is an extremely thorough program. Many duplicate checkers are limited to comparing the file name, size, and date of creation to compare files and flag them as duplicates. VisiPics uses an algorithm to examine each picture and compare it to the rest, seeking out similarities based on the actual image not just the parameters of the file. VisiPics allows you to specify the degree of filtration. On the strictest setting it looks for tiny differences to consider the images distinct, the looser you set the restrictions to more liberal it becomes in comparing items. An example of this in application: on the strictest setting VisiPics considered two photographs of the same person taken milliseconds apart where their facial expression had changed only very slightly to be identical pictures. When adjusted to a more lax setting it allows for greater variations in photographs and still considered them duplicates. VisiPic is not the kind of program that you want unleash unsupervised on your photo collection, it certainly can't tell if the difference between one photo and another is the difference between a genuine smile and a grimace. It is however an excellent tool for culling your collection, especially if you're an avid photographer with a preference for use the burst mode when you're shooting. Be forewarned, because Visipics actually compares the content of the photo instead of just the file metadata it is a CPU intensive process. Scanning 29,000 photographs during my test run of the software required approximately 2 hours of background processing while I used the computer for other tasks. For another photo comparison-engine check out Duplifinder. 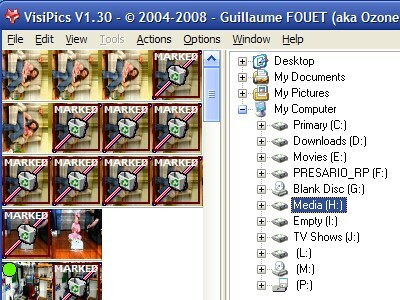 For a quicker, but less intensive method of scanning for duplicate files check out DoubleKiller.